After visiting colourful, bustling Yogyakarta and the stunning Borobudur, we leave the touristy part of Central Java behind and head into the country. Our trip will take us in a circle around the two large volcanoes that sit in the centre of Java, Gunung Merapi and Gunung Merbabu, and we’ll see the mountains from all angles. The first stop is Wonosobo, a small town at the foot of the mountains. We see a lot of Wonosobo, as the town has an intricate web of one way roads and side streets, and we have to circle it a couple of times before we can find the hotel. Traffic is fluid, and the town pretty, so we don’t complain. Our hotel is a charming colonial one, build as a retreat for Dutch planters in the 1920s. The only other tourists we see are, if not Javanese, Dutch, unsurprisingly. 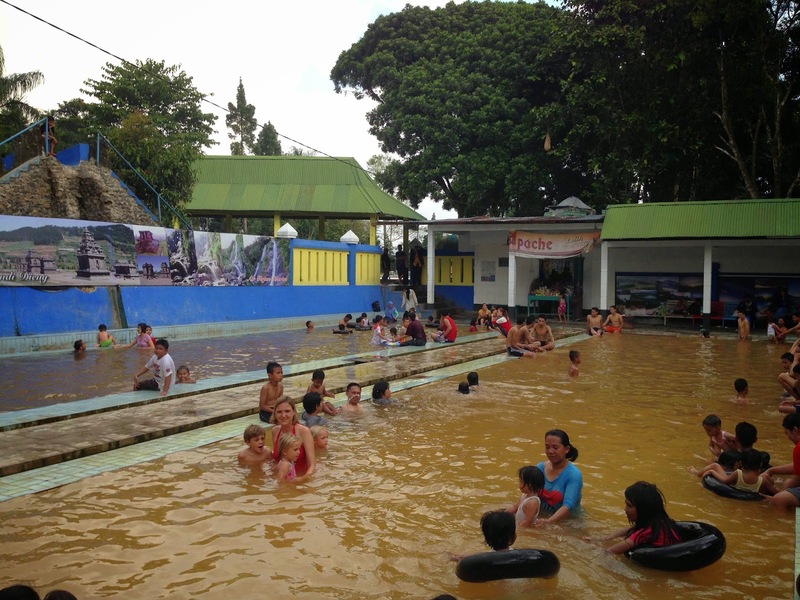 That afternoon we visit the hot springs in Kalianget. Concrete, tiled public baths have been built around the springs, and they are full of locals having a bath. Some scrub themselves and their young children with shampoo in the sulphuric water, which has a lovely temperature just under 40 degrees. Needless to say we are the only white people, and quite an attraction. The sulphuric spa water is rust coloured, and smells like rotten eggs, but very pleasant, especially in the cool mountain air. What will usually follow with hand, feet and many smiles, is a discussion about the kids, how old they are, after which I enquire after their kids, and where they are from. Many Javanese travel to see the sights of their own island, and we are not the only tourists. Just the only white ones. I will end with remarking how beautiful the temple/ area/ pool/ volcano is we are at, and then our limited vocabulary will be depleted. Off course no conversation is complete without a posed photograph. We joke we should get our own ticket book, so we can start selling tickets whenever someone wants to take our picture. In Indonesia, we’d be millionaires soon. Since we bought the ticket, we decide to explore the park, entering it through a giant fish head. The park is, like many things in Indonesia, badly neglected. You can see it has been nicely build, but has never been maintained. One of the problems in Indonesia is that especially rural area’s don’t know a collective garbage collection. Even if you could get people to not drop their rubbish where they stand, what would they do with it? The only answer is burning it, which makes villages smelly and smoky. Many gorgeous places are full of plastic, spoiling the beautiful sights for us Europeans, especially ones used to the immaculateness of Singapore. Behind the park is a football pitch, where lads in meticulous gear and shoes play on a rough field. We sit and watch it for a while and eat our snack, and try not to add our plastic to the garbage behind us. Great post.If you are an expat and plan on moving to Singapore, you may want to check out www.placematch.sg. I found it to be very useful in finding a place.